Use coleslaw mix to make a quick and easy treat! Eat as a snack, side or a meal. Use coleslaw mix to make a quick and easy treat! Eat as a snack, side or a meal. 2. Heat oil in a wok or large pan over medium-high heat. Add coleslaw, green onions, bean sprouts, wine, oyster sauce, soy sauce, and shrimp. Stir-fry for about 2 minutes, until cabbage is wilted. Mix cornstarch with 1 tbsp. cold water and add. Stir for about 1 minute, until sauce is thickened. 3. Spray a cookie sheet with cooking spray. Place 1/4 cup of the mixture on the middle of an eggroll wrapper, turned like a diamond. 4. Fold the bottom corner up, over the filling. Fold in the two sides, then roll upwards. Put a dab of water on the corner to help it stick. Place on the pan seam down. 5. Repeat until you run out of the mixture, about 20 rolls. Eggrolls can be close, but not touching. Spray the tops with cooking spray and bake for 15 minutes, until golden brown. Serve with sweet & sour sauce or spicy mustard. These make *great* leftovers, warmed or cold. The wrapper becomes a little softer, and more like a fried eggroll. 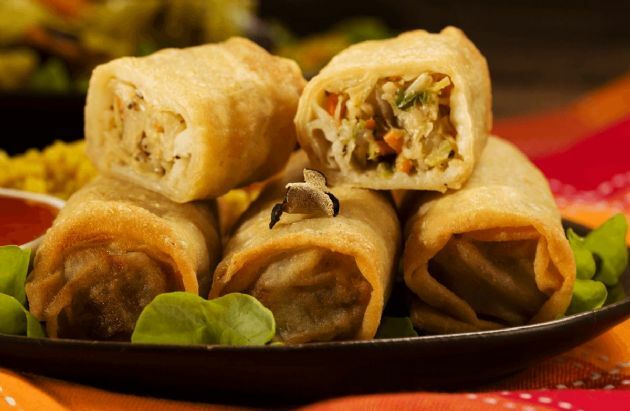 So, if you don't care for the crispy texture of the baked eggrolls, try them again the next day! Also a great recipe to cook with the kids. Have everyone try wrapping a roll! Create a little assembly line and have them measure out the mixture as you wrap.